Fountain Studios, an artist studio and project space in Prospect Heights, Brooklyn since 2008, houses 11 studios and a gallery. It’s also a performance, project, and community space and. It’s also the location of Fountain Fair, a vintage and handmade goods craft market. Upcoming at Fountain studies is the MassArt Alumni Show, taking place from February 4th – March 3rd, with an opening reception on Saturday, February 4th from 7-10 pm. Featured artists include Juan Jose Barboza, Kevin Buchholz, John Burkett, Bruce Campbell, Stephanie Cardon, Natalie Collins, Stephanie Costello, Alex DeMaria, Hilary Doyle, Kate Goyette, Don Hershey, Janne Holtermann, Phil Jung, Jessica M. Kaufman, Marketa Klicova, Robert Knight, Wilson Lawrence, Sebastien Leclerq, Rob Lomblad, Sarah Lubin, Billie Mandle, Sarah Moran, Matt Murphy, Irina Rosovsky, Owen Rundquist, Erik Schubert, Rebecca Sittler, Catherine Stack, Lou Susi, David Tames, Elizabeth Thach, Joey Tipton, Johanna Warwick, Bahar Yurukoglu, and Michael Zachary. – via Fountain Studios in Crown Heights, Brooklyn — Lost At E Minor: For creative people. 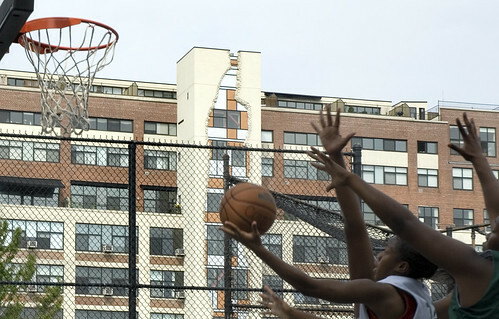 Brooklyn Chief of Staff Marty Maher is coming to a joint meeting of Friends of Dean Playground and Dean Street Block Association to share plans for improvements to the playground. A comfort station will be built this year and a little further into the future the seating area will be renovated. Please join us to learn the details and see the plans! Jan 19, 10:15 am: at The Sunburnt Calf, a bag (belonging to the owner) was swiped off a table. Contents: a $2,000 MacBook Pro. Apparently the owner left it unattended for about 5 minutes around 10:15 am in the empty, unlocked restaurant. Jan 19, 3 pm: at The Wine Exchange, a woman grabbed a store clerk’s bag and ran. The bag had $300 in cash and $250 in jewelry in it. Some time between 11 pm Jan 18 and 1:30 am Jan 19: at Weather Up, an iPad was grabbed from an unattended bag. More info: String of Thefts on Vanderbilt Avenue – Prospect Heights, NY Patch; photo via Brooklyn Exposed. Found – Lost Cat, Prospect Place between Grand Ave and Classon, Brooklyn » Brooklynian. Her “manager” came along and things got pretty tense: IDT energy scam « Brooklynian | Brooklyn Blog and Message Boards. via Local muggings! Look out! « Brooklynian | Brooklyn Blog and Message Boards.